I just finished reading a fascinating book by a fascinating and courageous person: Mosab Hassan Yousef. Mr. Yousef gave up so much that he held dear to follow the beliefs of his new religion, Christianity. His devotion to Christ led him to helping people, all people: Muslims, Christians, Jews, etc. His father, Sheikh Hassan Yousef, was one of seven Palestinians that created Hamas in 1986, but Mr. Yousef was a principled and honorable man, unlike many of the other Hamas leaders, and led me to conclude that he is mostly responsible for his son also being a principled and honorable young man. Christianity opened young Mosab’s mind to compassion and forgiveness and enabled him to take a second look at the Israelis, whom he was taught to hate by the culture he was raised in. At some point he thought that he could save many lives on all sides of the Palistinian-Israeli conflict by working with Israel’s Intelligence service, the Shin Bet. In fact, he did save many innocent lives, including his father’s. In the epilogue, postscript and afterwards, Mosab ends the book by telling about his encounters in America, which I found to be very interesting, because by the end of the book I cared about what happened to him. 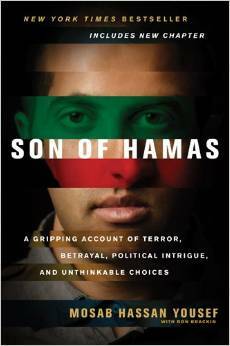 The book forced me to rethink Hamas and its true intentions: political power or a genuine concern for Palistinians? It also gave me a better appreciation on how being raised in a culture where hatred is celebrated, and also think about how fortunate I am for being born and raised in America. If you are interested in the Middle East, care about the people who live there, and want to understand what is happening there, this book should help.